Ciardis Weathervane returned to the imperial court of Sandrin to unite her foes. But her efforts hit a stumbling block. The imperial kind. She never thought that before rallying an empire, she’d have to fight the emperor himself. An imposter sits the throne and the court she turned to for help is in turmoil. Ciardis hasn’t survived assassination attempts, torture and really bad luck to be taken down by her own ruler. So she devises a plan. But first she needs to get Sebastian and Thanar to agree. Each seems to love her in their own way. But neither is listening to her. Pushing them to put aside their differences, in an effort to ward off catastrophe, might be harder than displacing an emperor who would do anything to keep his throne. Butting heads at court isn’t Ciardis’s only problem. With the princess heir’s threat looming she is forced to travel to the mythical city of Kifar, where it is up to her small group to stop the destruction of the entire city while heading a rebellion that could foment a revolution. It wouldn’t be the first revolution that Algardis has ever known. But with Ciardis Weathervane at its head—it would certainly be the last. 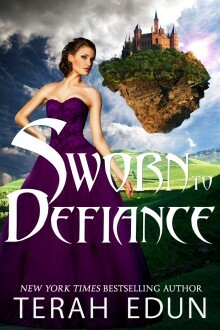 This fifth novel continues the story of Ciardis Weathervane from Sworn To Secrecy. "This is quite literally the most heart-wrenching, complicated and realistic love triangle you are ever going to see." "Terah Edun has spun a tale of intrigue and romance in a magical world of epic proportions." "Sebastian and Ciardis are not the same people as they were in Sworn to Raise...they have matured in character and actions..."